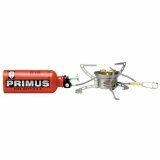 When we set off, we carried a second-hand Primus Multi Fuel Burner (it looked brand new!) and two fuel bottles; one of 1 liter and a smaller one of 0.6 liter (both Sigg). It is all a question of fuel accessibility: the multi-fuel stove burns everything and because we probably won't be able to buy CampingGaz canisters in Central Asia for example, we decided to go with the multifuel cooker. Using unleaded petrol is really good, cheap and efficient. It was decided not to use diesel anymore after everything in a short distant range went black! We used the Multi Fuel for several years under the most extreme circumstances and it hardly ever let us down. Only once did it not start it's engine; at 4000 meters in the northern Pakistani mountains. Possibly due to the dirty fuel from Central Asia. We cleaned it and it started working again. When we were in the USA, we tried to find some replacement parts, so we could keep using the stove for the remainder of our trip. When we got in touch with NA Gear, the US distributor of Primus stoves, they offered us a new one! We didn't have to think about that very long, so we are now the proud owners of a brand new Omnifuel. This one's even better! It has better control over the flame, with two levers. You just have to have one of these on board if you intend to have an outdoor kitchen. There's no way around it. The MSR, Primus or Brunton flexible aluminum versions are by far the best. We had a concertina folding screen like the Liberty Mountain or Coghlan's brand for a while, (only because we could find nothing else in western China), but it was rubbish when it came to keeping the wind out and they are build too high for fuel stoves. One small tip for the heat reflector disc, which usually breaks up before the windscreen does, is to buy a cheap aluminum flan dish with removable bottom. We've had ours for nearly the full trip and it doesn't look like giving up the ghost yet. We like to cook every night if we can and not just packet soup or noodles. Out kitchen is extensive, probably more so than most: we still like to eat well, even though we are on the road. The trusty aluminum Camp Art cookset, which we had for 12 years or so was recently replaced in South Korea by a French brand called GM Sports cook set. Choosing camping cookware is a very personal thing, but this is our criteria when looking for cooking gear: Because our menus are more elaborate than just spaghetti and a tin of tomatoes, we like to have several pots and pans. We therefore prefer the stackable cooksets. Hardened aluminum, without teflon coating is also what we generally look for. Both the Camp Art and the GM Sports are made from this. Some will complain about things burning and sticking, and sure that can happen if you try and cook like you would at home. Instead you need to develop a method of pot changing and be organised about the order of cooking things. Then you won't have any trouble with aluminum cooking gear. We make delicious curries and stews and even fry pancakes without the washing-up hassle that so many describe. Aluminum is durable enough but more importantly lightweight without the titanium cookware price tag. Essential though is that the pots have a good grip or handle system. We don't like dangling wire handles like the old scout billy can: they are simply a hazard and pot clamps or grippers are just plain annoying. If you should opt to buy a set that requires pot grippers, then for goodness sakes invest in the more expensive heat-resistant type. You'll be grateful for the extra cash spent. Instead we would prefer any of the flip together or clip in place handles that are permanently attached to the cooking pan. Furthermore, these should have some plastic insulation on them as well. Examples of this can be seen on the following products: the GSI Bugaloo frypan, Optimus Terra Weekend cooking pot or Stansports Black Granite cookset. So the key factors to look for when choosing camping cookware are the price, stacking qualities, bulkiness, weight, the handle or grip system, (will they last the life of the pot) and general durability. When purchasing, hold the thing in your hand as though you are cooking with it and imagine a bit of weight inside the pan. Does it feel good? Does it feel sturdy? If you say yes to these two questions and all the other factors are what you are looking for then it will probably do the job. It took us a while to get used to our GM Life Sports cook set after so many years with the Campart set, but it has proved to be a pretty good replacement. A kitchen sink seemed a helpful tool to take as well; for washing, the dishes, even water collection. The Sea to Summit sink designed in Australia holds 10 liters of water and is only 110 grams (when empty...) Keeping with Ozzie tradition and the best use so far: to keep the beers cold! We have used this sink for more than two and a half years, almost constantly, for the most diverse purposes. Doing the dishes, washing clothes, washing ourselves, keeping drinks cold, testing bicycle tubes for holes etc. It is perfect, small to pack and lightweight. Better than any of its competitors for size, weight and price! We bought a water purifier, the Katadyn Pocket with a weight of 550 grams. It filters 1 liter per minute and the element can filter up to 50,000 litres. It protects against bacteria, protozoa and chemicals in the water. This amazing pocket filter from Katadyn has saved our lives and lots of money on so many occasions we can't speak more highly of it. If you plan to go off on an extended bike tour, or will be visiting countries where the tap water is not drinkable, then this is brilliant. If you intend to venture into areas where you know the water will be fairly clean, then a very leightweight option is the Steripen: either the classic handheld or the adventurer version with solar re-charger kit attached. The Markill container is an overrated piece of rubbish. I wouldn't bother buying this product ever again and in actual fact we threw it away. Yes, all €34 euros worth of it. The problem lies in the inner plastic section cracking all the time and you have to replace it at €8 a pop. They have bettered it over the years (we have bought enough of them to know this), but the plastic rubber always stretches way out of control, so you can never seal it properly. Conveniently, they don't sell the seals separately. A much better choice are the Lock & Lock containers. They're just brilliant for anything: food, loose items, you name it. Not only are they lightweight, they come in all sorts of sizes, both square and round. They are air and liquid tight and supposedly indestructible unless you have a spare week to open and close the hinges around 3,000,000 times. And the best thing is they are cheap. No, really cheap! We purchased these cause they looked pretty groovy. Foldable cups from a tough rubber material that can fold down, so they are half the size. They take up little room, though because they are made from plastic they do tend to take on flavours and smells of the drinks they have in them. Again this is one of those things that is up to the individual to decide if it is important or not. Being vegetarians and always chopping up fresh vegetables and herbs, means this is a kitchen must for us. We can't live without it and over the years we have tried all sorts of cutting boards out. The cutting boards that are lightweight and that fit in the panniers easily are definitely the flexible boards. Not only are they great because you can curl them up and not spill anything when putting the chopped veggies in your pot, but they are dirt cheap too. So, if one gets a bit messy after a while then just throw it away and buy another. Only disadvantage is, they usually come in sets, so you have to buy more than one, but hey if you are at a campsite at the time, give the others away as a present. You'll be liked for that! Personally I prefer the style like the Norpro Cut and Slice boards, but other people have been satisfied with the thinner versions like those from Progressive International. Some campers even cut these boards up so they have just a small circular disc that fits inside there pots and pans. That would be a little too small for me, but I can see it working well for others, less into extensive camp cooking. Plastic document bags or specially designed zipper mesh travel bags are great when you are travelling for extended periods of time on a bike. Think of them as lightweight drawers of your pannier bags, your filing system for the kitchen, the electronic gear, whatever. Makes travel life easy and organised. In any case we love them. Travel Mesh Bags you buy these days can work out expensive. However, in some countries, especially in Asia, you can find versions of these at the stationary store. They often come in colours so it's also a really easy system of telling someone else where something is. "Can you get me the peanut paste in the yellow zipper bag" is a lot easier than saying "Can you get the peanut paste in the back pannier bag." Sometimes they will crop up at a dollar shop in the cosmetic shop section. Otherwise you'll just have to hunt around the travel goodies shop near you. Oh what a pity, don't you just hate that. Some things we threw away, not because it was a bad product, we simply didn't use it and considering we have to lug our weight with us, we stick to the motto, that if we don't use it, we ditch it, give it away as a gift to locals or fellow travellers or send it on to Australia. We were carrying a Zippo lighter, which burns on all kinds of petrol and a Primus fire steel, the optimum way of starting a fire or lighting your stove in all weathers. Water resistant, durable and effective (according to the manufacturer). We gave these away, we actually never used them at all during our trip. Buy two lighters at your local supermarket before you go and use those. Just before one runs out, keep your eyes glued to the road, there's always a lighter on the side somewhere. Pick it up again and you'll be fine for another few months. And as far as the fire steel was concerned, we just don't do enough backcountry camping to warrant carrying it along with us. Needless to say, the people that got them as presents appreciated them.